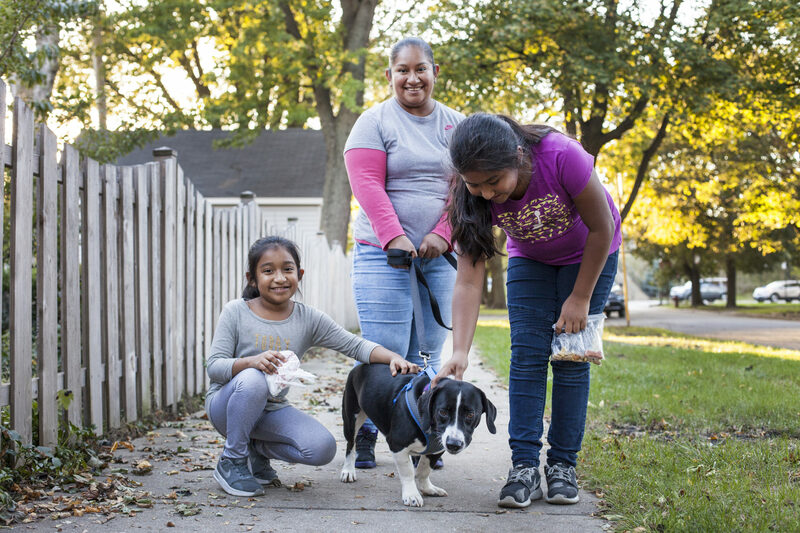 Volunteers are the backbone of Chicago Canine Rescue Foundation. We depend on volunteers like YOU to make our mission come to life! We are always looking for more volunteers. And the best part…you can volunteer as it fits your schedule and devote as much or little time as you want. No need to commit a certain day or time every week…unless you want to. There are many different ways to help to suit any of your interests. If you would like to walk dogs, you are welcome to come by the shelter any time between 10am-7pm – we are open 7 days a week. All you need is your photo ID, comfortable shoes, and to be at least 18 years of age. Our staff can help you fill out our volunteer waiver and get you started walking dogs. Parents are welcome to bring children along to walk, but only the adult may hold the leash. Students 16 and over can volunteer at the shelter with a signed permission slip, available at our front desk – students age 16 and 17 are not eligible to walk the dogs, but can assist staff with a variety of tasks around the shelter. Children under the age of 16 must be accompanied by a parent or guardian at all times. For children under the age of 16 looking to volunteer for a school or a group, they must track their own hours. If the child brings a form, we will sign it at the time of the walking to verify that the child volunteered their time walking with a parent. If the form is not presented at that time we will not be able to sign it at a later date. It must be brought each time the child and parent walk together. During the walk, the parent must be present at all times holding the leash. We unfortunately are not able to accommodate requests that we click on any external third-party email links to online hour tracking systems to verify your hours. We also are unable to verify hours over the phone or by email with a school or group representative as we will not have a record of the volunteer hours on file. We can also always use help in the shelter with bathing, watering, and cleaning the dogs and facility. We are open from 10 am to 7 pm although it’s best to come the first time in the mid to later part of the day so that the staff can help you get oriented. If you are interested in volunteering for events, please sign up for our mailing list on our web site. We will usually send out notices when volunteers are needed for events of all kinds, including adoption events, fundraisers, and community events. We look forward to having you join our team! Please sign up on our email list to stay current of specific volunteer needs or email joey@chicagocaninerescue.org with comments or suggestions. If you have a more specific question about volunteering, please, don’t hesitate to contact us at joey@chicagocaninerescue.org or by phone at 773-697-8848. If you are signing up to volunteer at a specific event, please include the event’s name and date in the subject line. THANK YOU again for your interest in volunteering with Chicago Canine Rescue and hope to see you soon!